Pacific Oceanfront Access To Kapoho's Champagne Pond Naturally Filtered By The Ocean Tides! Fantastic oceanside location in Kapoho Bay vacation rental home features 3 bedrooms and 2 full bathroom, new appliances, beds, furnishings and a fishing pad so visitors can fish the Pacific right from the property. Champagne Pond only a dog paddle away from Kapoho Oceanside Villa self catering lodging accommodations on the Big Island of Hawaii. Brand new Big Island vacation rental by private owner, Kapoho Oceanside Villa offers guests unbelievable panoramic views of the Pacific Ocean! Ideal family vacation rental on Kapoho Bay features a high speed Internet connection, satellite tv and a stereo system with CD & DVD player and a large wrapping lanai with amazing ocean views from every vantage. Wonderful family accommodations, this new privately owned vacation rental is situated on the quiet east shore of Hawai'i, allowing visitors to relax and enjoy the classic Hawaii of a bygone era. The kitchen features appliances including a full sized refrigerator, cook-top, oven, microwave, coffee maker, coffee grinder, blender, rice maker, cooking and serving ware... everything needed to prepare meals at home. Other Hawaii Beach Vacation Homes, Condos, Houses, Cottages . 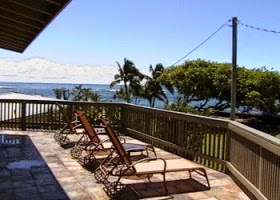 . .
Kapoho Oceanside Villa Home 3br 2ba Direct Ocean Access!